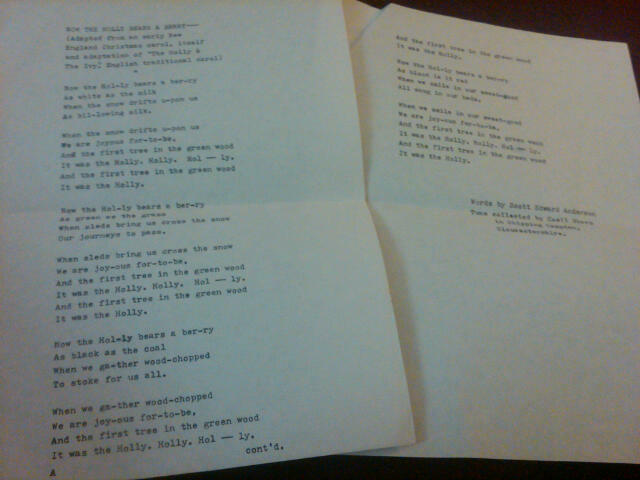 My typescript of "Now the Holly Bears a Berry..."
My 8-year-old daughter came across a couple of typewritten sheets of paper in a copy of The Penguin Book of Christmas Carols , edited by Elizabeth Poston. It was “printed” on a typewriter, as the picture to the right attests; the tiny holes marking most of the periods are also a dead give-away. To this day, I have heavy fingers on a keyboard. The crown is the crown of thorns, which if you have ever touched a holly leaf, you know its prickly scorn. The lyrics go on to draw analogues between the red berry of the holly and the blood of Christ, the “bitter gall” of the holly’s bark with the balm of Jesus as a redeemer. It is a curious mix of Christian and Pagan imagery. Holly was associated with the winter solstice and known to be sacred to the druids. I’ve always loved the tune — there’s an excellent version of it on the Chieftans’s Christmas album, The Bells of Dublin — but the lyrics struck me at the time of my version’s composition as too overtly religious for my then decidedly secular soul. So I rewrote the lyrics to celebrate the joys of the winter season. It was the Holly. Holly. Hol — ly. To stoke for us all. All snug in our beds. 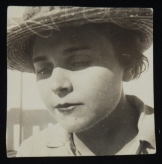 Elizabeth Bishop photo from Louise Crane Papers, Beinecke Library. As readers of this blog know, 2011 marks the centenary of Elizabeth Bishop’s birth. I’ve been trying to celebrate it in as many ways as possible and get to some of the events throughout the year, as well as visiting her grave in Worcester, MA, and promoting her work on this blog and on Twitter by using #EB100. Last week I attended Visions Coinciding: An Elizabeth Bishop Centennial Conference, organized by NYU’s Gallatin School and the Poetry Society of America. The conference featured interdisciplinary responses to Bishop and her work, including a slide show and talk by Eric Karpeles exploring rarely seen images of Elizabeth Bishop and a screening of footage from Helena Blaker’s forthcoming documentary on Bishop’s years in Brazil. The screening was followed by a discussion moderated by Alice Quinn, editor of Bishop’s posthumous collection Edgar Allen Poe & The Juke-Box: Uncollected Poems, Drafts, and Fragments , along with Blaker and Bishop scholars Brett Millier, Barbara Page, and Lloyd Schwartz. Day two featured two lectures on Bishop’s relationship with Art. Peggy Samuels gave a fascinating exegesis of Bishop’s interest in and influence by the work of Kurt Schwitters and William Benton displayed slides of Bishop’s own paintings, sharing his insights on their context in modern art. Jonathan Galassi moderated a lively discussion with the editors of recent collections of Bishop’s poetry, prose and correspondence, including Joelle Biele (Elizabeth Bishop and The New Yorker correspondence), Saskia Hamilton (Words In Air , the Lowell-Bishop correspondence, and new edition of POEMS ), Lloyd Schwartz (new edition of PROSE , as well as the Library of America edition of Bishop: Poems, Prose, Letters ), and Thomas Travisano (Lowell-Bishop correspondence). All this was followed by a reading by NYU Gallatin students who each read a Bishop poem and one of their own by way of response and, finally, a star-studded lineup of contemporary American poets, including John Koethe, Yusef Komunyakaa, and Mark Strand reading poems by Bishop. This week is the opening of Elizabeth Bishop: Objects & Apparitions at the Tibor De Nagy Gallery in New York. The show comprises rarely exhibited original works by Bishop, including watercolors and gouaches, as well as two box assemblages inspired by the work of Joseph Cornell. Unfortunately, I’m going to miss the exhibit of her papers at the Vassar College Main Library, From the Archive: Discovering Elizabeth Bishop, which is on view until December 15th. But there’s still time to celebrate Bishop’s centenary — until her 101st on February 8, 2012.